The mini-series No Justice is coming this summer and this new idea regarding the Justice League is original and brilliant! It will follow the events of Metal, and it’ll be written by Scott Snyder and drawn by Francis Manapul. It’ll focus on what happens when Brainiac comes to Earth and how it will cause heroes and villains to work together to deal with a greater threat. The members are Superman, the invincible Man Of Steel; Sinestro, a yellow lantern; Starfire with her incredible powers; and Martian Manhunter, who’s a shapeshifting alien. Wonder Woman, our feminist and iconic warrior; Etrigan the Demon, a real demon from hell whose strength is incredible; Rave, who's half a demon (which means she has mystic powers as well); Zatanna who's both a stage and actual magician; and the powerful Dr. Fate with his own magical powers. These characters all share a mystical past. Its members are Batman, the greatest detective and vigilante in the world; Lex Luthor, the smartest person in the DC universe; Lobo, who is often compared to Superman (and sometimes considered stronger) for his abilities; Deathstroke, an extremely skilled fighter; and Beastboy who is able to shape-shift. 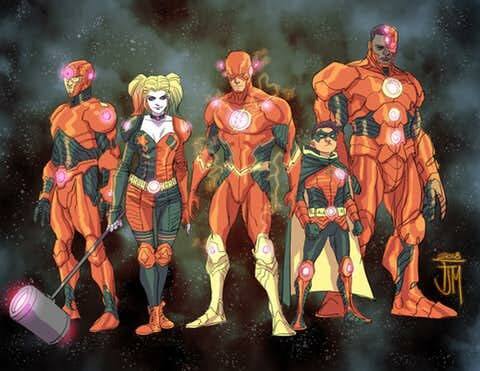 The Flash, the fastest man in the world; Atom, who is able to alter his body size; Cyborg, who is in part made of exoskeletal armor (which gives him incredible abilities); and Damian Wayne aka Robin, who's a skilled fighter trained by (and grew up with) the League Of Assassins. Also on the team is Harley Quinn, a gymnast and former psychiatrist who's infamous for her involvement with Joker. Snyder is known for being the writer of some of the best DC comics we know today, and the idea and preview of “Justice League: No Justice” is definitely exciting. We can't wait to see how the relationships between heroes and villains play out as they fight to save the planet!